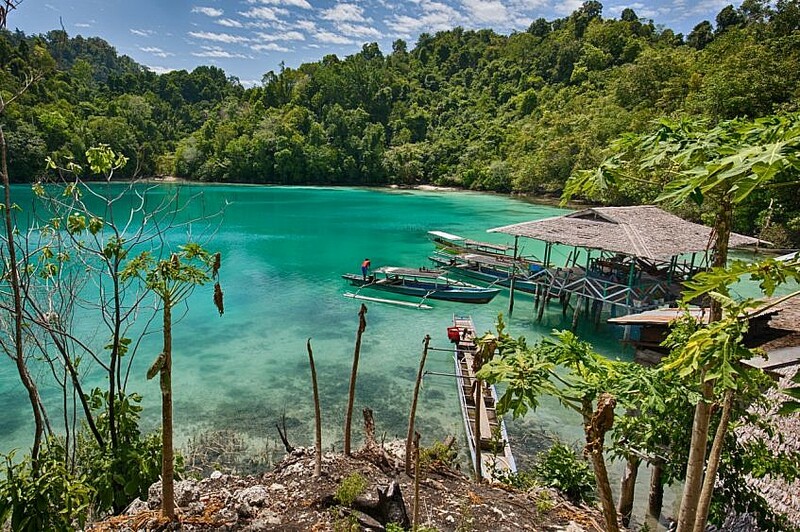 The most exciting thing about the Togian Islands is that there is nothing exciting. At least not in the way of party tourism. Nothing but the breath of the ocean, the tropical sky and the colours of nature. The excitement of this destination consists in its peaceful tranquility. Come down to earth and admire its beauty. I visited the Togians first in 2015 and fell in love with them so much that I returned again in 2018. There is hardly any place with mobile connection. Electricity is produced by generators during some hours after nightfall. And no ATM anywhere means you have to bring enough cash along. Better bring some more even, as you may want to extend your stay. 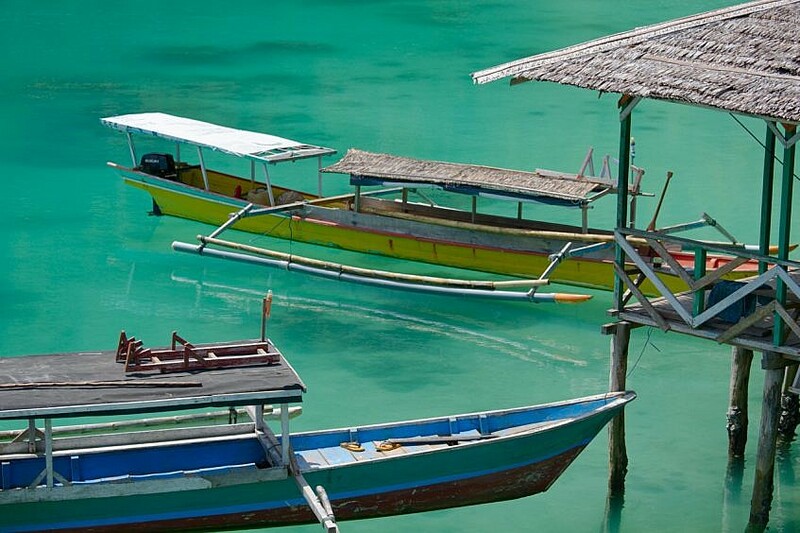 The Togians are an archipelago in the Bay of Tomini, south of the nothern peninsula of Sulawesi. Wakai is the major town and even has a hospital. 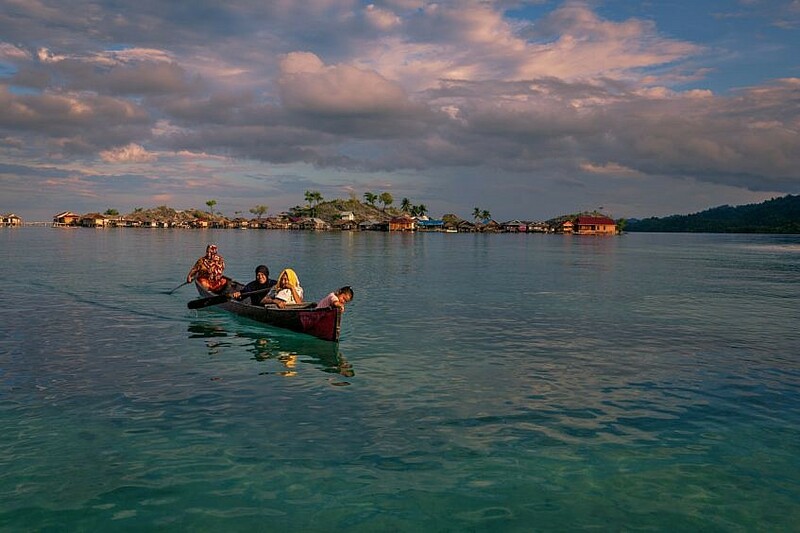 Many other villages are home of the Bajo (also written Bajau) people, formerly known as the “sea gipsies”. There is an ever growing number of resorts, most of which are situated on the smaller islands. Each one with its own “dream beach”. Most travellers visit two or three resorts while they are here. This is easy as one may either take a public boat or rent a private outrigger boat to hop from one island to another. We did so in 2015, visiting Poya-Lisa first, and then changing to Lestari Cottages on Pulau Malenge. Both are beautiful places, as is any other that I have seen on the way. On our second trip we stayed in Lestari only. 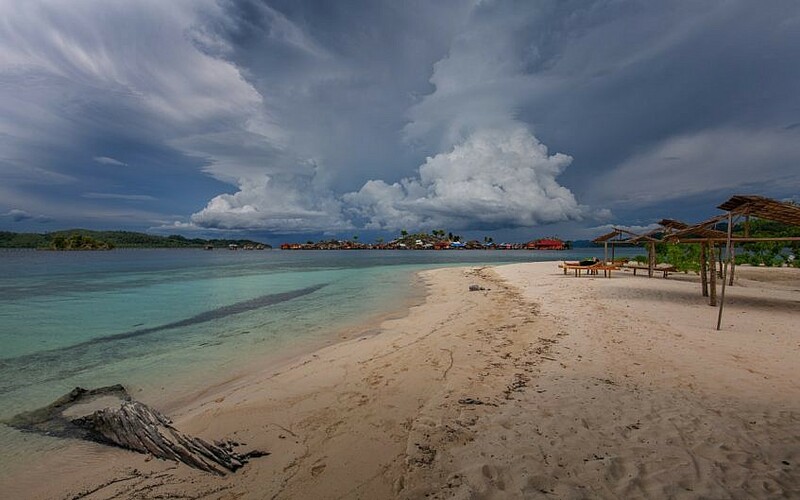 Lestari on Malenge Island is a resort with ten cottages run by a local family. Even though I enjoyed it a lot, I am not claiming this to be the best place on the Togians. After all I have not experienced all the others. 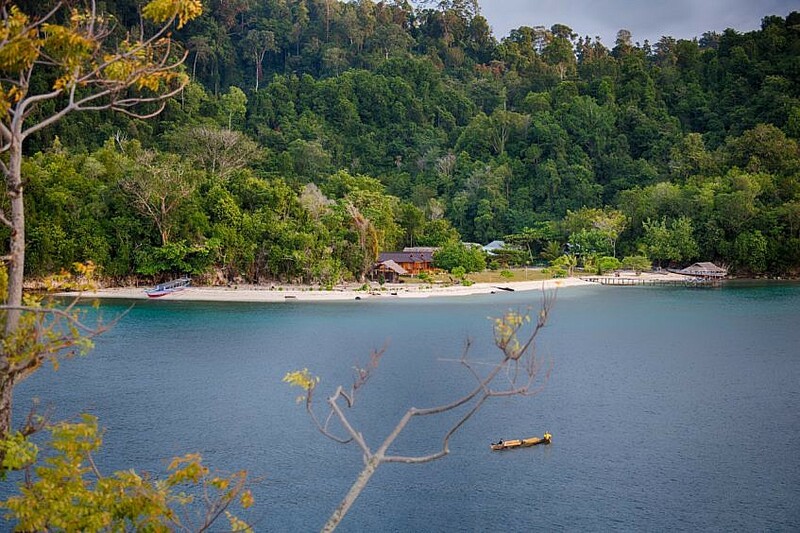 What makes Lestari different from many others, however, is the fact that it offers much more than just a white sandy beach and a coral garden. Let me show you what I mean with a set of images. First, the beach. It is as beautiful as anywhere on the Togeans, with fine sand and coral gardens just two steps into the water. The famous Reef No. 5 and California Reef are within easy reach and trips out there will be organized for 75k IDR per person. 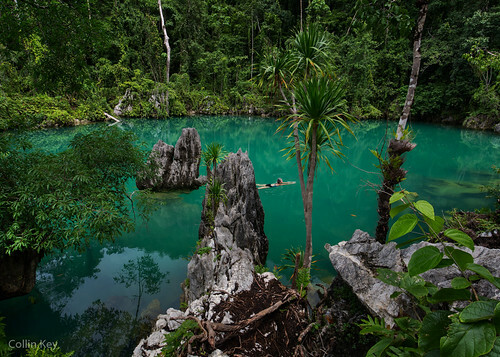 The resort lies on a small peninsula with this emerald lagoon at its backside. I could just sit here for hours, marvel at the amazing colours and listen to the sounds of the jungle. This is the perfect place to let go and deeply inhale the beauty! And it is a lovely place for breakfast, too. Behind the resort the jungle rises. 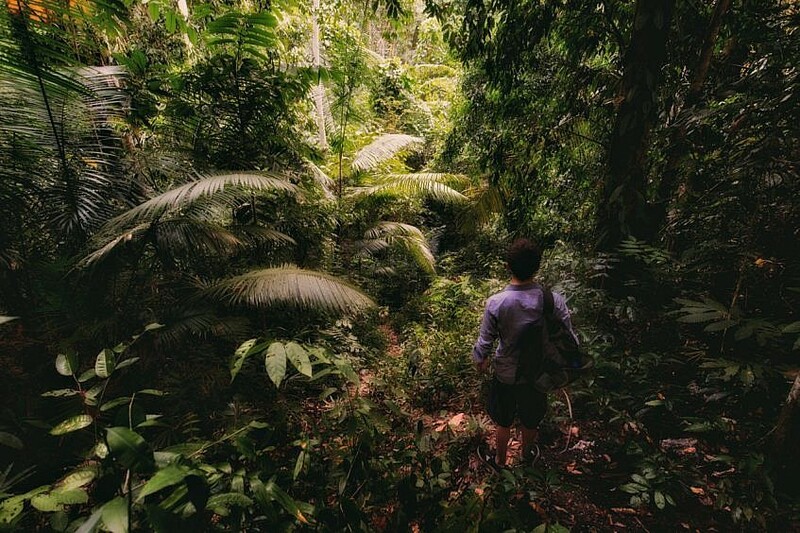 There is a path you can follow that leads to a cave home to millions of bats. The guys from Lestari won’t let you walk alone out there, since two people who tried went missing. Both of them were found the other day but, as one may imagine, they weren’t in a good shape after spending the night in the woods. 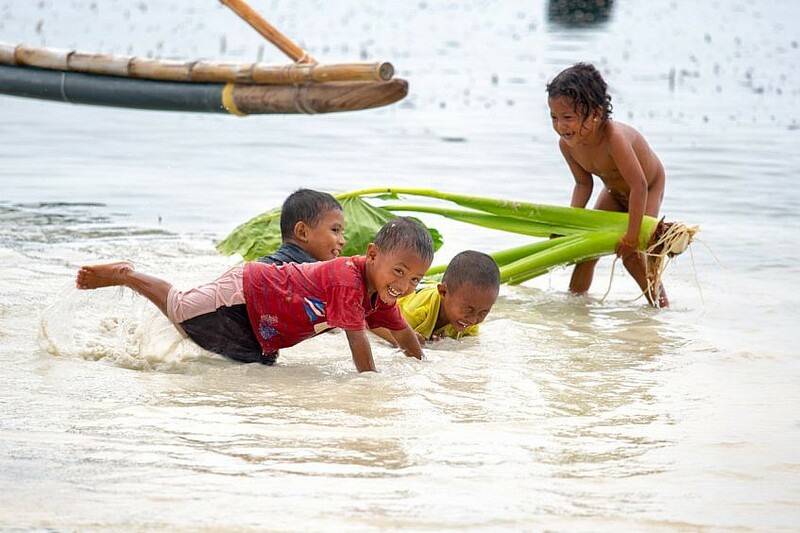 The Bajo (also written Bajau or Bajao) are traditionally sea nomads. Originating from the Sulu Sea around Mindanao, they used to travel the Malayan Archipelago without ever leaving their boats. 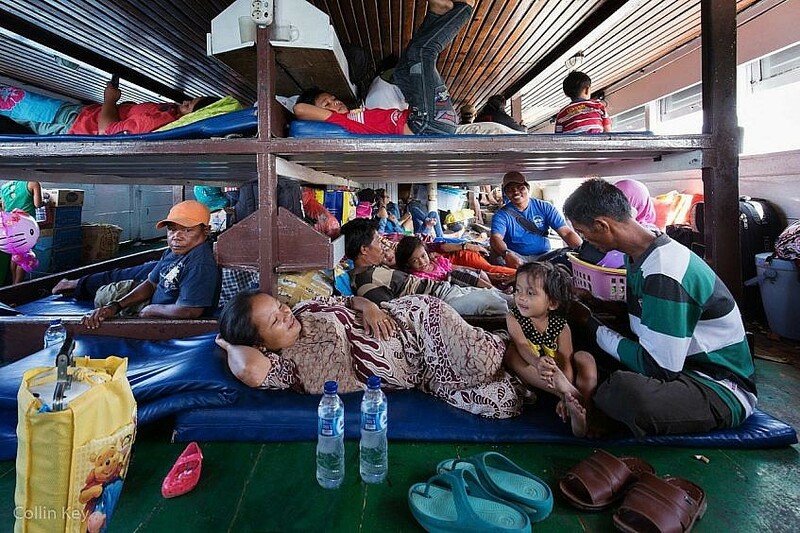 Slowly they migrated south to Malayan and Sulawesi waters. 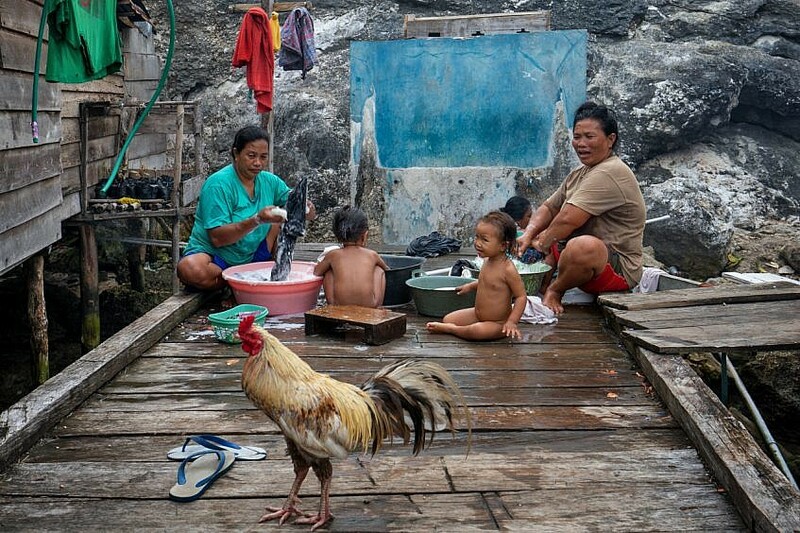 Nowadays, most of them seem to have settled, though their affinity to water is always obvious – their villages are most often found on remote islands or rocks, their houses often built on wooden pillars above reefs. Pulau Papan is a good example of this. It is fun to visit the village and witness some everyday life of the Bajo people. They are reserved, but friendly to visitors. And they have some very good badminton players, who play their game at a concrete court behind the mosque. So if badminton is your sport, ask if you may join in for a game. 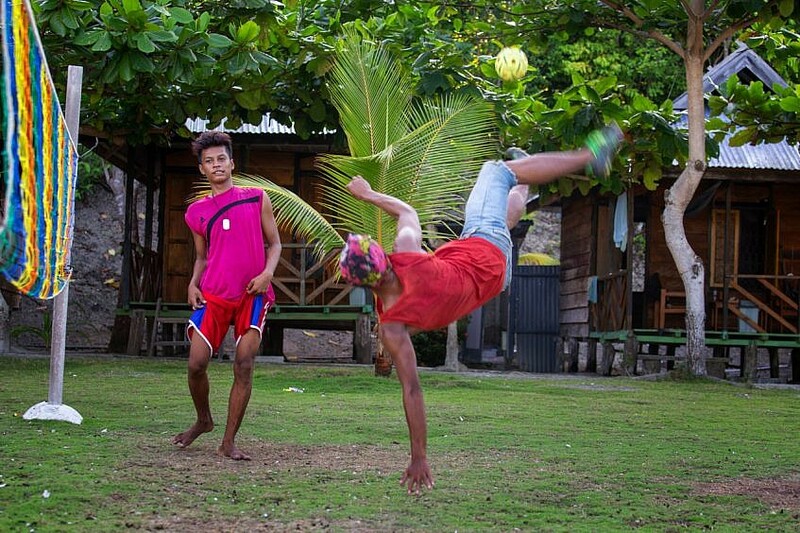 Sepak takraw or kick volleyball is another very popular ball game in Indonesia. It is played with a ball made of rattan. Three players in each team kick the ball over the net. Hands are not allowed. As a consequence the audience will see many artistic jumps. There is a sepak takraw field in front of the Lestari cottages. Every afternoon some boys from the Bajo village used to come over to challenge Rolly, Akbar and the other boys from the resort. A milelong jetty connects the rock of Pulau Papan with Malenge main island. 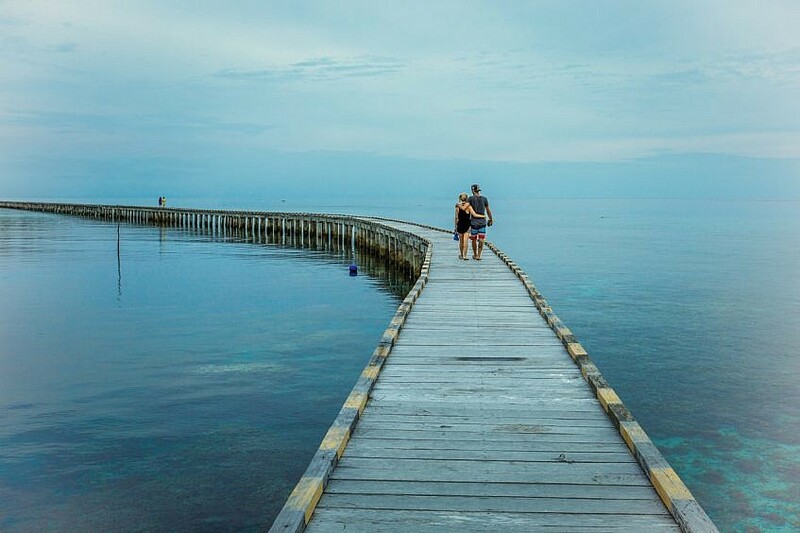 The jetty crosses the ocean above the reef and one can watch the many-coloured fish between the corals. This is the daily way to school for the Bajo kids. It is also a nice stroll for the visitors. As a habit, Akbar would approach the guests every evening after dinner to ask what their plans were for the next day. He and the other guys of Lestari really did a wonderful job, teaching us an Indonesian card game called parau-parau, playing the guitar at the nightly bonfire and accompanying us on various excursions. 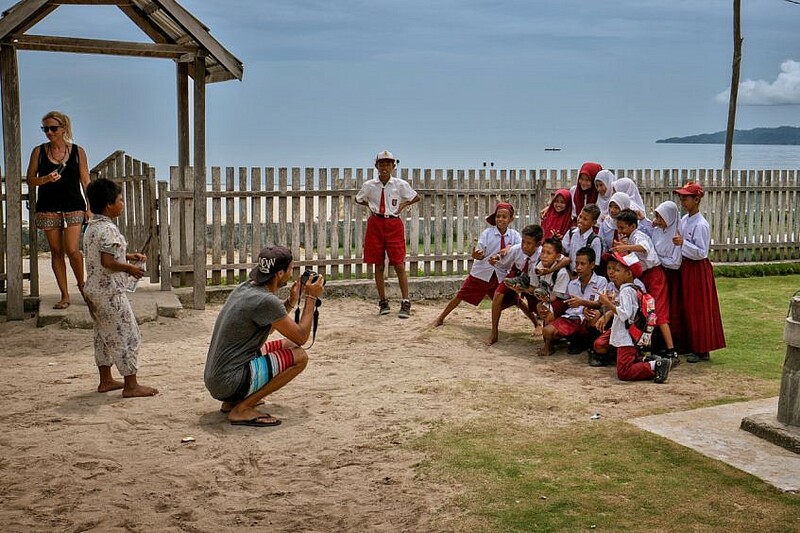 One of these excursions was a visit to the school of the Bajo kids. Students and staff were very welcoming as they presented to us what they had learned in their English lessons. The prices at Lestari were 200k, 250k or 300k IDR per day and person (depending on the quality of the bungalow). Three meals and water, coffee and tea are included. 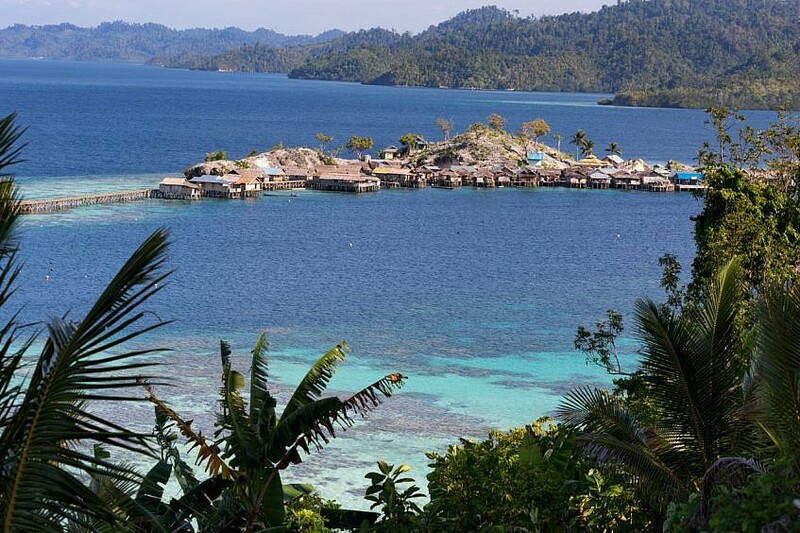 The Togian Islands can either be approached from Ampana (south) or Gorontalo (north). From Gorontalo a ferry connects to Wakai. The trip costs 64k IDR and goes overnight. You may either sleep on the tatami (mat) deck or in business class which offers slightly more privacy. There are no regular cabins but the staff rent theirs to travellers for 500k IDR. Arrive well before departure and ask any of the officers. From Ampana there are several boats going to the Togians. If you take the regular boat this will bring you to Wakai from where you either take another public boat to Malenge town (and then look for a small private boat). 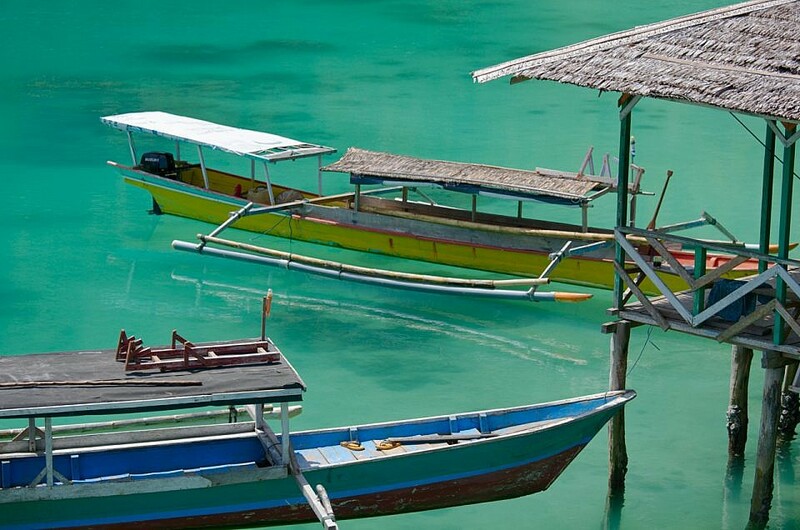 Or rent one of the private outrigger boats in Wakai which will bring you right to Lestari. Cost per person varies between 350k and 600k IDR. There is a fast boat also from Ampana that stops right at Pulau Papan, the Bajo village opposite to Lestari beach. Ampana has a new airport. To my knowledge, however, there is only a flight to Palu from where you have to connect to further destinations. If you have visited Rantepao and Tana Toraja before coming to the Togians, you can take a bus from Rantepao to Poso (consider 18hrs or more) and from there a car or bus to Ampana. This is a long and tiring ride but you will see some wonderful mountains and jungles. If you have a bit more time (you should!) consider to make a stop in Tentena. Beautiful landscape and a nice lake will help you to recharge your batteries. There you can relax at the wonderful bamboo cafe of the Mosintuwu Institute run by well-known women’s rights and peace activist Lian Gogali. My next post will be dedicated to Tentena and this woman. See the Black Marlin site for more information on boat connections. What seems a paradise at one moment can turn a desaster the next moment. 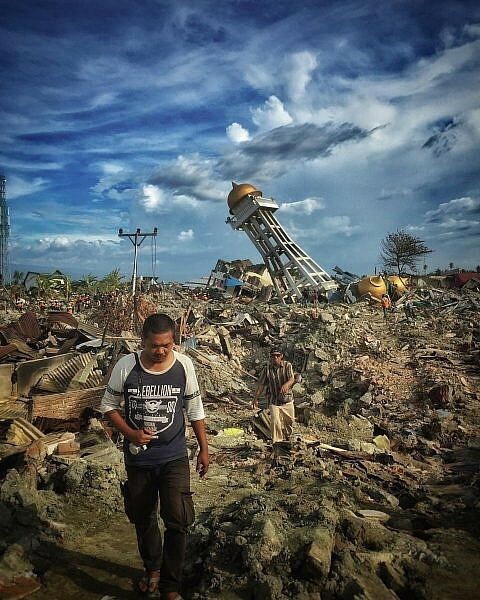 Palu, one of the possible stop-overs on the way to the Togians, has been hit by a desastrous earth quake and tsunami in October 2018. I want to express my sympathy to the victims and my appreciation to all the people who came to help. My friend Lisa Soba Palloan was one of them. Grundsätzlich wirken alle, auch „spielende Kinder“, auf mich märchenhaft und geheimnisvoll. Das liegt sicher nicht am Motiv, sondern an Deiner Bearbeitungs-Kunst. Dein Markenzeichen aber ist, so scheint mir, die durchgängige Stimmung, welche Du damit erzeugst: Ob See, Himmel, Boote, Menschen u. deren Hanlungen (Lebenssituationen),Tiere – alles befindet sich in einer gewissen Dramatik – manchmal durch Unterbelichtung – in einer leichten Schwere… schwebend getragen von einer wunderbaren Farbenpracht, die ihrerseits keine irdische zu sein scheint…. Mir fällt auf, dass ich oft das Wort „scheint“ oder „scheinbar“ benutze 🧞‍♂️🧚‍♀️ – in der Tat, es sind märchenhaftschöne Bilder ! Allein den waagerechten, „platten“ Blick auf einen Sandstrand mit Wald dahinter würde ich aussortieren: Wo ist da die künstlerische Graphik ? Oder liegt Gundel dort im Bikini ? Dann gehört es zu den privaten :). Aber: „Der Überlebende“ in den Trümmern nach dem Erdbeben ist gestochen dramatisch !!! Ausdrucksstärker geht es kaum u. das ohne Leichen…. eine wunderschöne, ästhetische Tragik…. Das Schul-Video erinnert mich an meine Musikschule-Gruppen: voller naiv-kindlichem Enthusiasmus, herrlich ! Ich wünsche Dir viel Erfolg mit Deinem „Hilfsprojekt“ Buch !